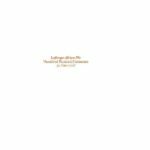 Further to the Market Bulletin with Reference Number: NSE/RD/LRD/MB6/18/12/17, dated 17 December 2018 on the above subject matter, Dealing Members are hereby notified that Lafarge Africa Plc has obtained the approval of the Securities and Exchange Commission to change the closure date of its Rights Issue of Seven Billion, Four Hundred and Thirty Four Million, Three Hundred and Sixty Seven Thousand, Two Hundred and Fifty Six (7,434,367,256) ordinary shares of Fifty Kobo (N0.50) Kobo each at Twelve Naira (N12.00) per share, on the basis of six (6) new ordinary shares for every seven (7) ordinary shares held as at 4 December 2018. Lafarge Africa Plc is a cement manufacturing company in Nigeria offering high quality concrete and aggregates for the home building and construction sectors. The company is one of the oldest cement manufacturing companies in Nigeria and is a member of the LafargeHolcim Group, the largest building and concrete solutions company in the world. It also diversified interests in manufacturing paint, repairing electric motors, transport services and Kraft bag production. Lafarge Africa Plc has plants in Ewekoro and Sagamu in the South West district; Mfamosing in the South-South district; and Ashaka in the North East district of Nigeria. The company has installed cement production capacity of 10.5MTPA and has plans to increase its production capacity. Its product range includes cement, aggregates, ready-mix concrete and pulverized fly ash. Cement solutions are marketed under the brand names Elephant, Ashaka, Supaset, PowerMax and Unicem. The company’s head office is in Lagos, Nigeria. 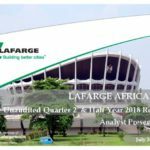 Lafarge Africa Plc is a cement manufacturing company in Nigeria offering high quality concrete and aggregates for the home building and construction sectors. The company is one of the oldest… READ MORE.